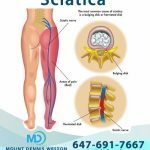 Our unique, high-tech and modern Decompression Traction System (DTS) Spinal Decompression Therapy is able to provide major relief for pinched nerves and disc injuries in both the lower back and the neck. Spinal decompression therapy safely decompresses spinal discs and spinal joints by using traction, distraction, and body positioning. Research to develop this procedure was conducted by prominent physicians, engineers and technicians at major teaching hospitals. Our Decompression Traction System has been clinically proven to provide pain relief and decrease symptoms associated pinched nerves of the neck and back. Studies have shown that spinal disc injury is responsible for a significant number of lumbar/leg pain and neck/arm pain syndromes. The sharp, electric-like pain that shoots down one’s arms or legs from a pinched or choked nerve can cause some of the worst possible pain that a person can experience. 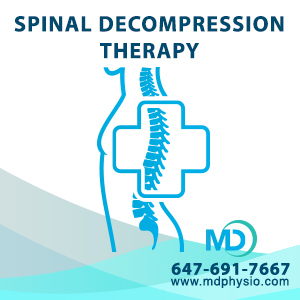 Using the decompression therapy in conjunction with other physiotherapy and chiropractic treatments provided in our clinic can effectively relieve the pain and disability resulting from disc injury and degeneration. The treatment aids in the healing of damaged discs and spinal nerves. Our new, computer-controlled Triton DTS is designed to apply distraction and decompression to the patient’s spine without producing reflex spinal muscle contractions and spasms. 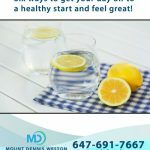 By significantly reducing internal disc pressure, decompression traction therapy promotes retraction of the herniation spinal disc material back to a normal physiologic position and promotes the intake of fluids, oxygen, and other substances necessary for healing the spinal disc and surrounding tissues. The Triton Decompression Traction System uses computer technology to control variations in the unloading (traction pull) of the spine, effectively avoiding the body’s muscle contraction response. Your therapist can control how many progressive tension steps you experience before reaching the maximum tension. Also, the therapist has complete control over how long the tension is held for and how often it is repeated through the computerized system. While lying down on the table, the Triton DTS’s computer simulates an anti-gravity effect on your spine that helps herniated spinal disc material to move toward its normal position, thus, reducing spinal disc pressure and pain. Patients typically describe the treatment as a gentle, painless and an intermittent pulling sensation. 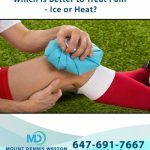 It has proven to be effective in healing serious, debilitating pain even in cases where patients have “tried everything” with no healing success.